Scratch-resistant, pinlock-ready face shield for AGV Skyline, Horizon, Numo Evo, K3 SV, S-4 SV, K5 K1 Helmets. Note: Does not fit AGV K3 or Numo helmets. Not all images show Pinlock pins. For the price of this visor I would not have expected the mounting tabs to crack and break while riding, on a helmet that is kept indoors after only 7 months of weekend riding. the iridium silver scratches just breathing on it. Very annoying as it looks very cool and very dark for the blazing texas summer sun. Since it's so high priced, they should at least supply a tear off to protect it on install. If you get this, spend the extra $20 for a pack and make sure you have soft baggy to pack-it away when you switch it out at night/clouds. Cracked around pinlock pins after less than 2 months. I bought the pinlock insert for my helmet from pinllock before I realized I needed a different visor and was pretty excited when I saw Revzilla was finally carrying the one for my helmet. I used it for a ride in Barcelona on a rental bike for a few days and then commuting to work for several weeks. I returned from a camping trip to the Black Forest to find little micro cracks around the pinlock holes. The plastic washer that goes around the screw deteriorated and fell off and the other side fell off a week or so later. Pinlock no longer hold the seal which makes it work so moisture gets underneath it. Pretty disappointed. Love the Smoke for My K3SV. I had been using sunglasses with the clear shield for a month now, and the new smoke visor makes a world of difference. Clear and wide field of vision, as sunglasses cut some of your peripheral vision off. The visor is dark enough so that I was comfortable riding in sunny conditions all day, yet not too dark to be completely dangerous if you were to ride in the evening. You could even make do at night with this, not ideal though. From the outside, this visor looks pitch black and is very sharp on my matte black k3sv. Happy with the product, price was good with some zillacash. I do not have pinlock lens installed but feels good to have it ready to go if I wish to get one. It is NOT scratch resistant. On my second day of having this visor it had already 2 huge scratches. The seal mechanism for a ziplock bag (which is plastic) made a significant scratch on it. For the second scratch I dropped the visor on the floor from half a feet height. I was sitting on the edge of my bed putting the visor on and it slipped. A fall that wouldn't even crack an iphone screen, made pretty bad scratches on it. Will this fit the K1? BEST ANSWER: When a pinlock insert is attached to the shield, it prevents fogging. However, the material of the shield itself is not anti-fog. So there is not anti fog coating similar to the clear shield that is included with the K3SV? As shown on thw video, and the faceshield has an inscriptoon “AGV GT2”. The faceshield of my helmet seems exactly the same as the ones in the pics. Then how come this faceshield wont fit Numo helmets??? What does it mean by "pinlock"?? BEST ANSWER: Pinlock is a product that consists of a smaller piece of acrylic that attaches to the inside of the face shield. It creates a small air gap between the shield and the insert which works like a thermo-pane window to reduce fogging on the inside. A Pinlock compatible shield has two pins on the inside that are used to hold the insert in place. There are videos online that show how to install a pinklock insert onto a shield. Is the dark smoke pinlock compatible? Description is vague. I have the K5S just want to make sure I'm getting the right smoked visor? Does the shield come with the pins? Yes. The shield has the mounting pins for the Pinlock visor. The Pinlock visor is a separate purchase. Yes, It comes with pins, but not the Pinlock anti-fog insert. 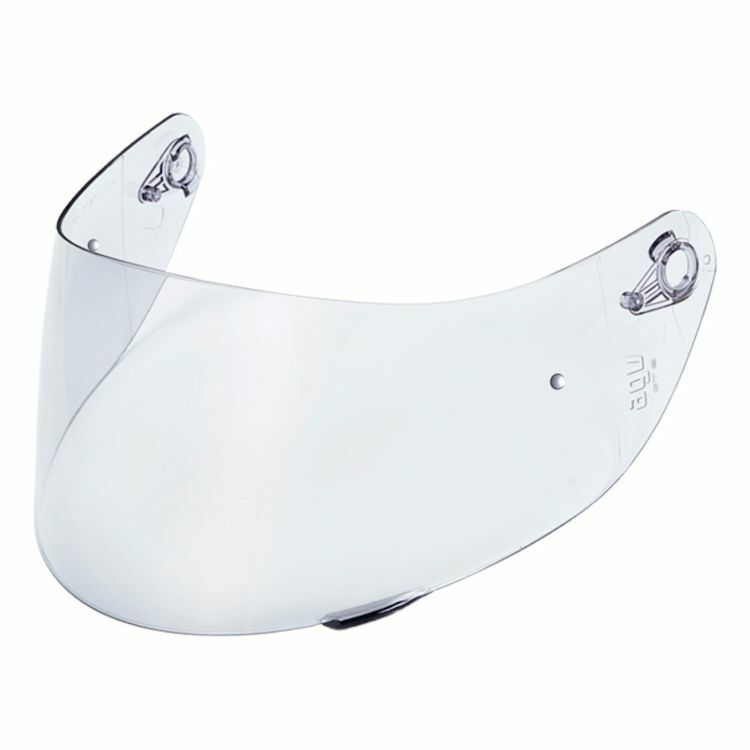 The clear visor you can clearly see it has pin locks, do the others have it also? To answer your question: From my part, I have the Irridium Grey visor and it has Pin lock on each side of the visor. hope it'll help you. I bought the gold one and it fit perfectly, same as the clear one. Yessir...came with the pin locks on my iridium gold. My dark smoked shield has them. Does the shield come with the pinlock insert or just pinlock ready? BEST ANSWER: This shield has the Pinlock mounting studs only. The Pinlock insert must be ordered separately. Yes it does come with the insert. I bought one for my k5s and it works perfect. It does not include a pinlock insert. I have a K3-SV , i want know if is available with my helmet? BEST ANSWER: This will fit your helmet.